Holmfields have over 20 years experience providing residents of Loughborough, and the surrounding areas, with beautifully designed and manufactured home fittings. 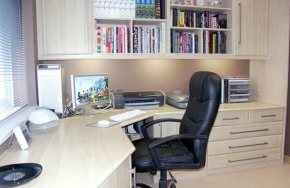 Whether you’re looking for a new kitchen, bedroom, or home office, we will offer you a professional and personal service. Not everyone is fortunate enough to have the option to work from home. However, if you are lucky enough, you may want to create a dedicated space to complete your work. This can help to boost productivity and avoid distractions. From desk space to bookcases, we are proud of our ability to create both practical and stylish fitted home offices for our customers in Loughborough. We can help you to create the perfect combination of storage and display space to eliminate clutter whilst adding your own personal touch to the room, making for the ideal workspace. 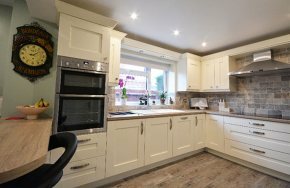 Whether you’re looking for a traditional, contemporary or shaker style fitted kitchen, our designers can help you to create a truly unique kitchen that matches your own personal taste. Traditional kitchens often feature solid oak doors, or open shelf units, complemented by composite stone or granite worktops. The modern yet classic shaker style keeps your space simplistic yet stylish. Or maybe you’re looking for something a little more contemporary with glass splash-backs and spotlights. Whichever style you go for, we undertake the individual design and installations of kitchens in Loughborough. We also only use Gas Safe plumbers and qualified electricians for your peace of mind. Our bedroom designs help you to maximise and make the most of your space, with stunning fitted wardrobes offering storage to help you create a relaxing and spacious room. 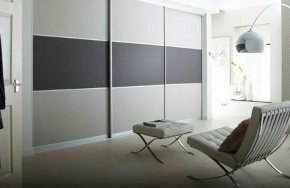 Our built-in wardrobes can feature hinged or sliding doors depending on your preference. We can also incorporate pull down garment lifts, double hanging rails, and many other useful features. At Holmfields we will listen to your design ideas and offer you our expert view. If you need help with ideas we will happily help you. Our design team creates your ideas using a computer software to help you visualize what your new kitchen, bedroom or home office will look like. Our team provides an excellent and dedicated customer service. As a result, we’ve had many Loughborough residents praising us on our staff. To find out more information or to get some inspiration, you can visit our showroom or contact us on 0116 255 6668.